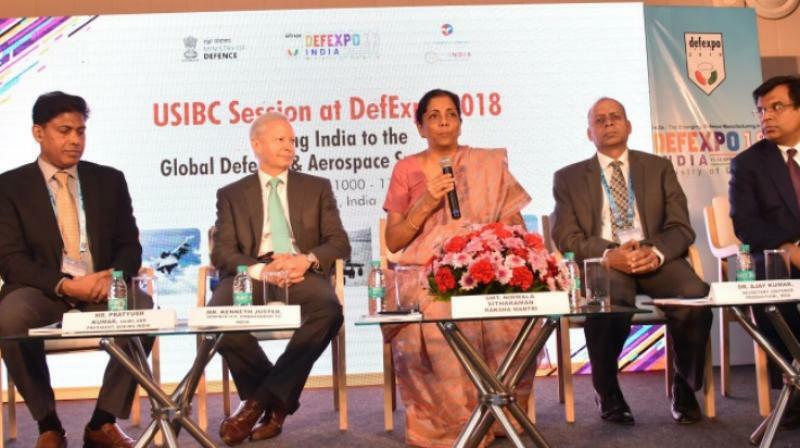 Chennai sources stated that the government cannot compel the armed forces to buy indigenous weapons, Defense Minister Nirmala Sitharaman said after inaugurating a major defense exhibition the DefExpo that aims to project India as one of the major defense manufacturing hub in the world. Presently the NDA government is trying to project the 10th edition of the biennial event as first serious attempt to transform India into a hub of military manufacturing and pursue its goal of achieving turnover of Rs 1,70,000 crore in military goods and services by 2025 by promoting the domestic defense industry. Meanwhile according to a report Sitharaman, while speaking to reporters at exhibition in Thiruvidanthai near Chennai, said she can't "force the forces" to buy only "Made in India" equipment. Furthermore according to the Defense Ministry, over 670 defense firms, including 154 foreign manufacturers, are participating in the exhibition of weapons and military hardware. Moreover it is being attended by official delegations from over 47 countries, including the US, the UK, Russia, Afghanistan, Sweden, Finland, Italy, Madagascar, Myanmar, Nepal, Portugal, Seychelles and Vietnam.